Researchers have also been developing electronic tongues, which allows machines to taste. 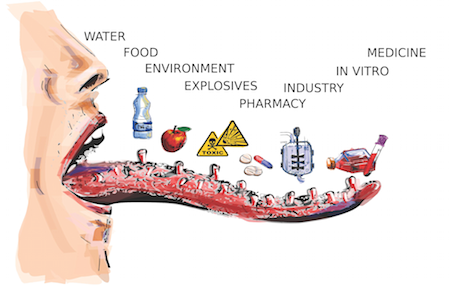 Electronic tongue systems are traditionally used to analyse: food products, water samples and taste masking technologies for pharmaceuticals. In principle, their applications are almost limitless, as they are able to almost completely reduce the impact of interferents and can be applied to distinguish samples of extreme complexity as for example broths from different stages of fermentation. Nevertheless, their applications outside the three principal sample types are, in comparison, rather scarce. In this review, we would like to take a closer look on what are real capabilities of electronic tongue systems, what can be achieved using mixed sensor arrays and by introduction of biosensors or molecularly imprinted polymers in the matrix. We will discuss future directions both in the sense of applications as well as system development in the ever-growing trend of low cost analysis. We have dozens of different sensors, which respond to molecules in our food. Our brain gets input from all these and combines the data to produce the taste of, say, orange juice. Golden Age great Anthony Boucher was already thinking in this direction in the 1940's. Consider the robot taste buds from his excellent 1943 short story Robinc. "Half your time in cooking is wasted reaching around for what you need next. We can build in a lot of that stuff. For instance, one [mechanical] tentacle can be a registering thermometer. tapering to a fine point - stick it in a roast.... And best of all - why the nuisance of bringing food to the mouth to taste? Install taste buds in the end of one tentacle..."